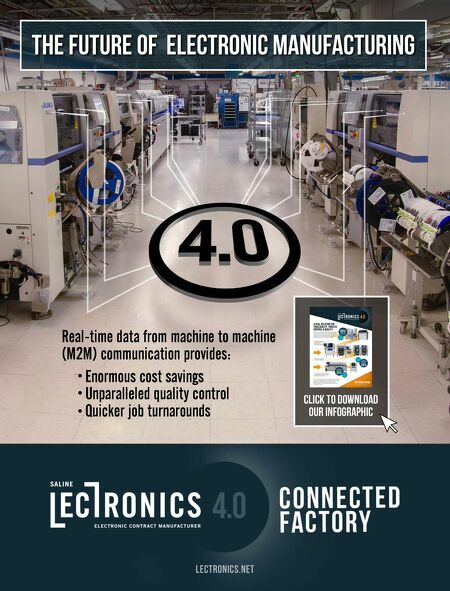 26 SMT Magazine • May 2017 by Rick Short INDIUM CORPORATION Mark Reece is the perfect example of why In- dium Corporation invests in student programs. In 2015, while employed part-time at a lo- cal furniture warehouse and working toward a bachelor's degree in electrical engineering tech- nology, Reece was selected to participate in In- dium's Summer College Internship Program. During his time as an engineering intern, Reece excelled and gained recognition for his excep- tional work in advancing key projects. "Mark was the ideal intern," said Dawn Roll- er, director of HQ Services. "His work ethic was outstanding, his personality was a perfect fit for our company culture, and his work exceeded our expectations." Two years later, Reece is now a manufactur- ing support engineer with the company, and he has some words of advice for organizations that want to get more out of their internship pro- grams: "Don't assign menial tasks. Give your in- terns real projects with firm deadlines. Take the reins off and let your interns become full mem- bers of your team and you might be pleasantly surprised." While Indium performs traditional recruit- ing efforts to attract industry professionals, as a global electronics materials manufacturer and supplier, we also recognize the importance of targeting the next generation of talent. That is why we have tasked Jim McCoy, talent acqui- sition coordinator, with developing, managing, and administering talent acquisition strategies and programs. "We see students as incredible assets," said McCoy. "The science, technology, engineering, and math field is constantly evolving. Pairing students and young professionals with the sea- soned industry experts at Indium enables us to stay in tune with the cutting edge of academia, while leveraging the extensive technical knowl- edge we've built as a company." Not Your Average Interns Indium's Summer College Internship Program provides 10 college students with a 10-week full- time paid internship. Applicants are subjected to a rigorous application and interview process for this highly competitive program. In 2017, there were more than 300 total applications. "We know that our former interns speak highly of the program. As we've developed this program over the past few years, and because word of mouth, we've seen a huge increase in interest. I think the program is so competitive because the students know they will gain really valuable experience," McCoy said. 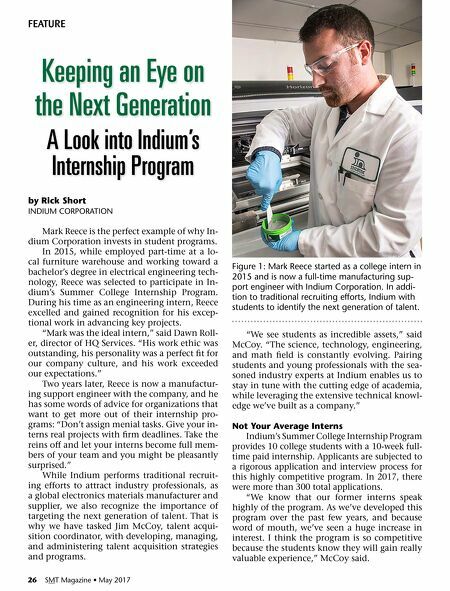 Keeping an Eye on the Next Generation A Look into Indium's Internship Program FEATURE Figure 1: Mark Reece started as a college intern in 2015 and is now a full-time manufacturing sup- port engineer with Indium Corporation. In addi- tion to traditional recruiting efforts, Indium with students to identify the next generation of talent.